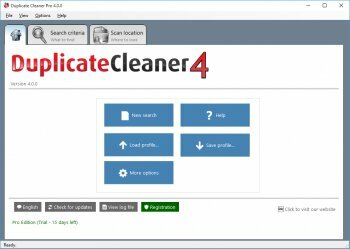 Duplicate Cleaner is the latest tool to assist anyone in cleaning up the contents of their personal hard drive or corporate network. You'd be surprised just how many redundant files you could find forgotten in an obscure documents folder. Photos, music, Word documents, PowerPoint presentations, videos - you name it, if it appears twice on your system then Duplicate Cleaner will find it. Here is a simple free one, written by me.. Note that version 3 is a pay program. Version 2, which is available too, is freeware. The new 2.0.6 version is out. The tool is very useful with intuitive steps and menu actions. Helps sort, group and select faster than other apps of the kind. I do not know how this works for some, but for me it did not. I asked to scan a local 50Gb partition + a mapped drive (same size); after about 10 minutes it was still showing 2% scanning progress but the GUI was not visible and the program locked. I had to kill it from task manager. Do I have to wait a full day for this to work? Make sure to check the forum for features that are planned for future releases. Nice use of threading with InprocServer32 much faster than my old favorite Big Bang enterprises' DoubleKiller Standard 1.6.2.82. DoubleKiller does not need registry entries though. Very fast (uses checksums the way they are supposed to be used), works as promised. Works fine (even) in Vista64.